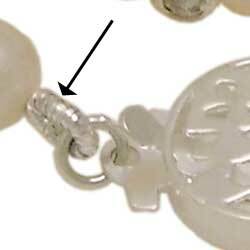 French wire, also know as gimp, gimp wire, or bullion wire will give your hand strung beads and precious gemstones a professional finish as well prolongs it safety by decreasing wear and tear on the stringing threads. Our full article on French wire also gives a simple way of using this finely coiled gimp wire. The technique below gives another and a more detailed step-by-step guide. Be sure to take note of the Tips below. 1) After you have strung your beads, pass the one end of your thread through a crimp bead and a suitable lenght of French wire/gimp. Then through the ring of your clasp. Do not try to pass the thread twice through the gimp. If you do the gimp wire will not form properly and you could end up with a mess. 2) Pass the thread back through the crimp bead and pull tightly. The giimp should now look like a metal loop going through your clasp-ring. 3) (opt) Pass the thread through more beads for security. 4) Squeeze the crimp beads with crimpling pliers to secure and fix the threads. Cut off excess threading. 5) Do the same with the other side of your strung beads. Do a few pratices of using this technique before applying it to a real piece of jewelry creation. After a few tries, you will get the hang of how much French wire to use and how tightly to pull to form the 'metal loop' with the gimp wire. It might be a good idea to wax or treat your thread to make things easier.